↑ "Allende". Random House Webster's Unabridged Dictionary. ↑ "Chile: The Bloody End of a Marxist Dream.". Time Magazine. 24 September 1973. "Allende's downfall had implications that reached far beyond the borders of Chile. His had been the first democratically elected Marxist government in Latin America..."
↑ Winn, Peter (2010). "Furies of the Andes". in Grandin & Joseph, Greg & Gilbert. A Century of Revolution. Durham, NC: Duke University Press. pp. 239–275. |access-date= requires |url= (help) Winn, Peter (2010). "Furies of the Andes". in Grandin & Joseph, Greg & Gilbert. A Century of Revolution. Durham, NC: Duke University Press. pp. 239–275. ↑ "Chilean president Salvador Allende committed suicide, autopsy confirms". The Guardian. United Kingdom. 20 July 2011. Retrieved 12 October 2015. 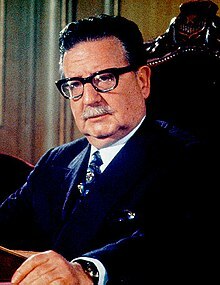 ↑ "Chile inquiry confirms President Allende killed himself". Bbc.co.uk. 2011-07-19. Retrieved 2012-09-12.